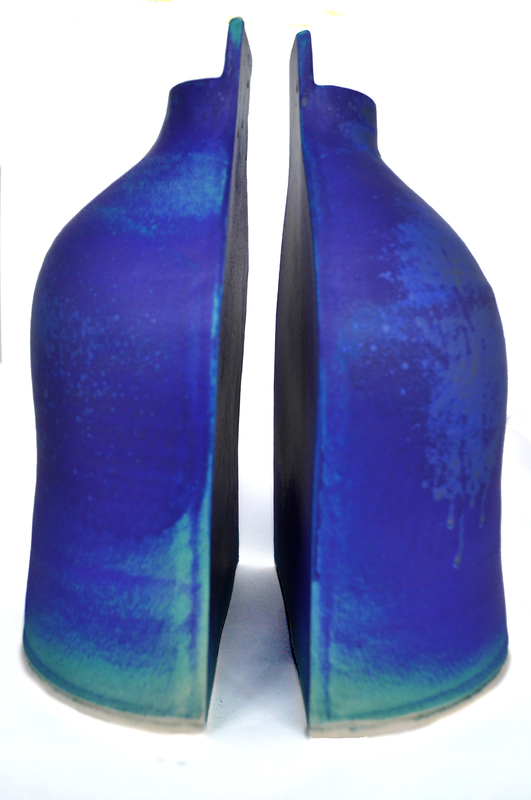 These are urns designed for two people that are thrown from the same vessel and then split vertically and made into two pieces. 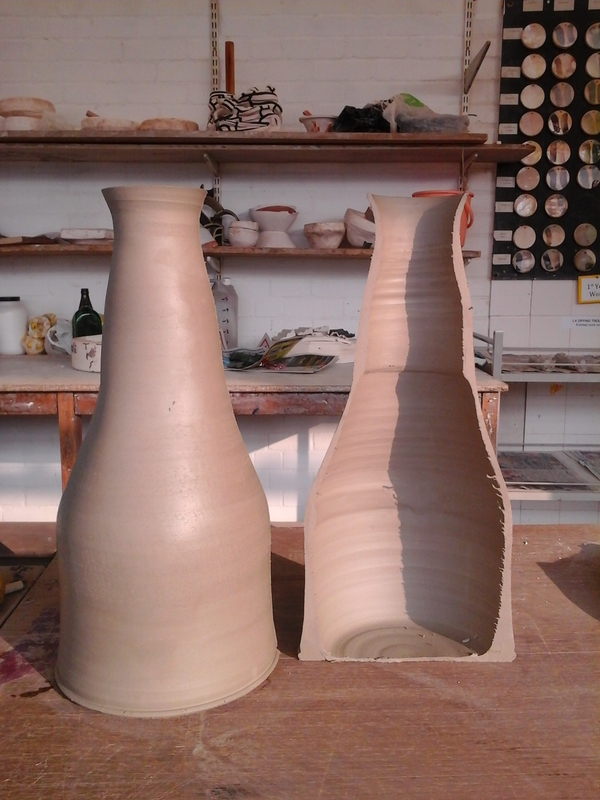 The latest design I’m working on, is instead of the inside split being completely flat against each other, one will concave, and the other is eased outwards to mimic the curve, so that they fit together.This is a great new development, and the next stage is glazing them all! 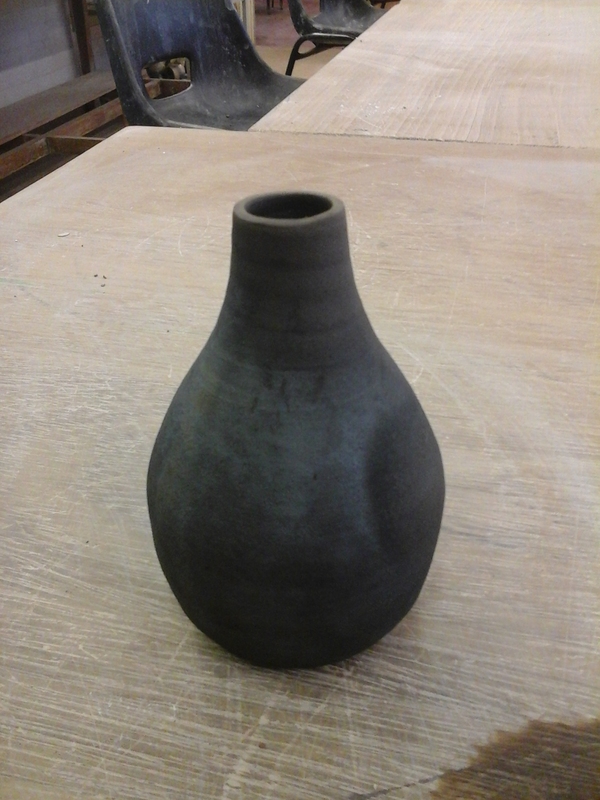 I have my first one out, and its an earthenware deep matte barium blue glaze, and I absolutely love it! 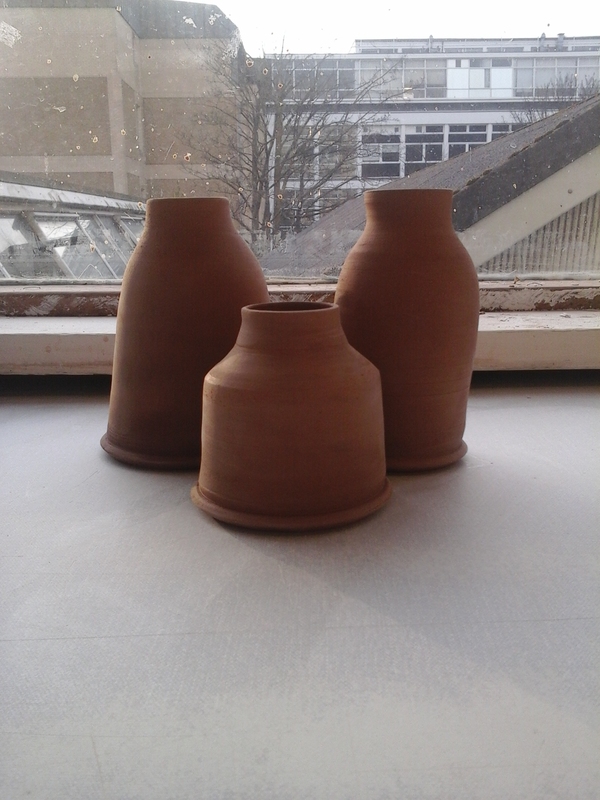 I hope to have three more for the final show, so I still have one more to make! 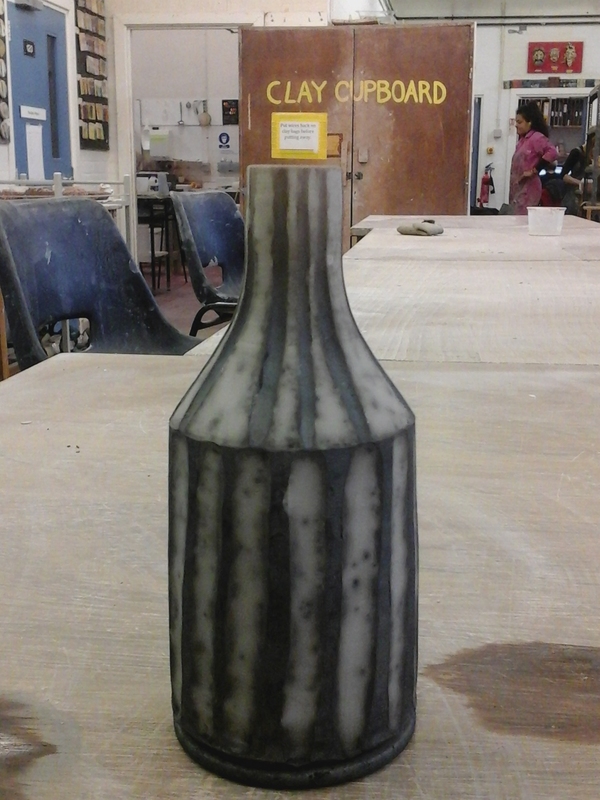 The finished Deep Barium Glazed piece! Memory Boxes and Memory Disks. I am making memory boxes to be used to hold items of sentimental value that have been passed on from a loved one. I myself have many small objects that belonged to my Grandfather. 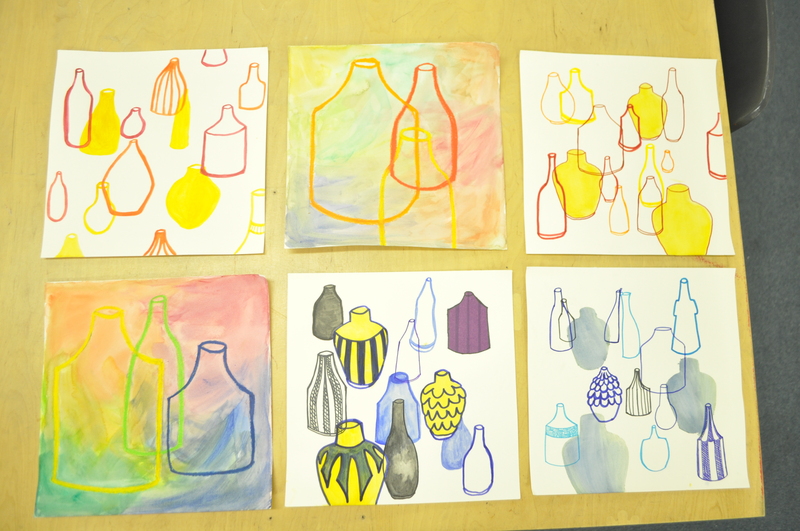 I am making drawings and paintings using collections of these objects and old photographs, that I will make into decals and fire to the ceramic lids. I only have a few photographs of my Granddad and I, and by firing theses images onto the ceramic, they can be treasured forever. 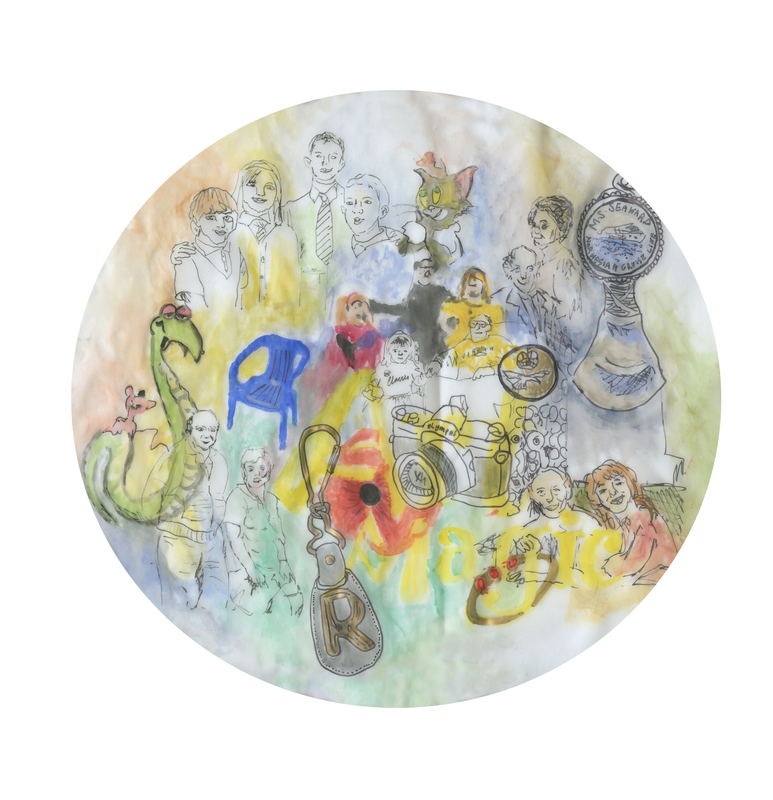 I wanted the piece to look watery and quite jumbled, as my memories of him are very old and quite faint now, so I mainly used watercolours and drawing pens. 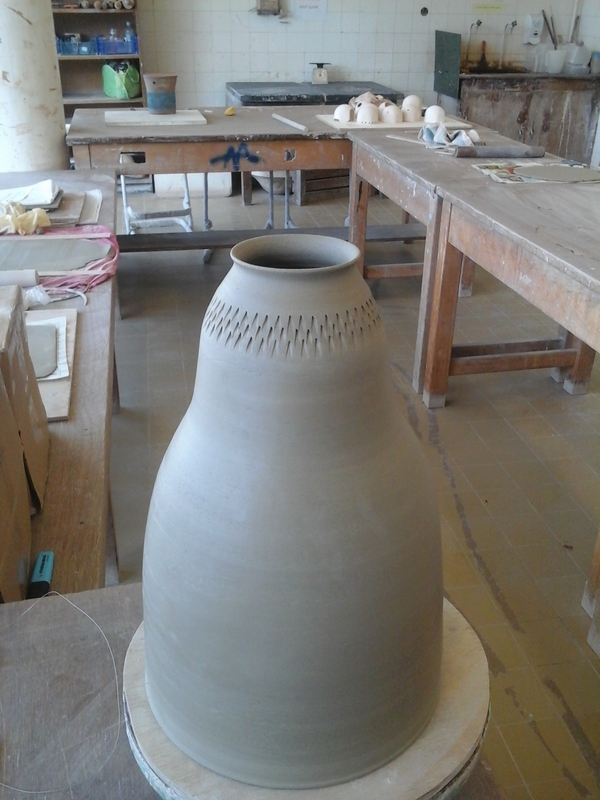 This is an unusually crafted piece, as I threw it as an enclosed form, then turned it upside down and cut the lid away from the now top of the pot. It was thrown in one piece, with the legs added on in the leatherhard state. 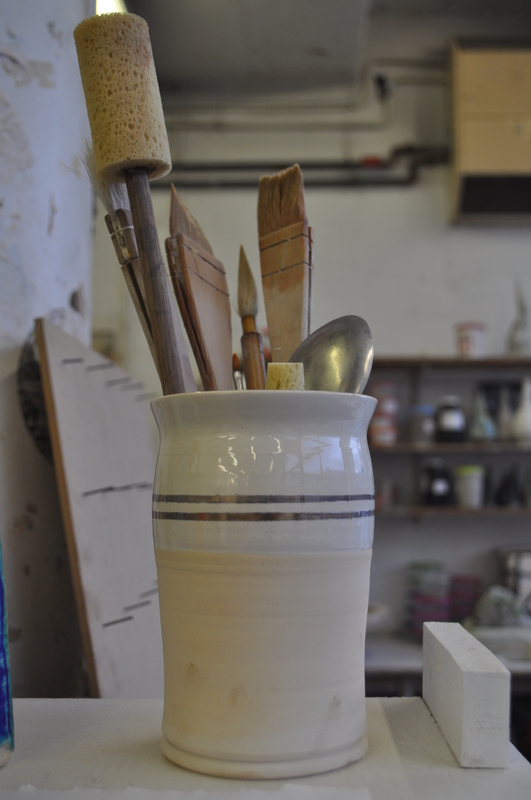 It is fired to 1260 using the tin white glaze I developed in my second year (It is an earthenware glaze, but also looks lovely into the Stoneware ranges!) 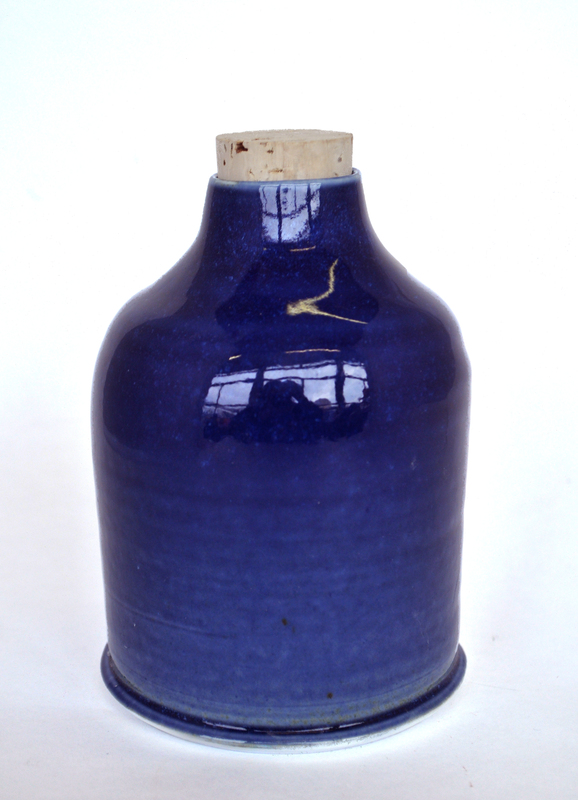 and a blue stoneware glaze on a petra grog body. 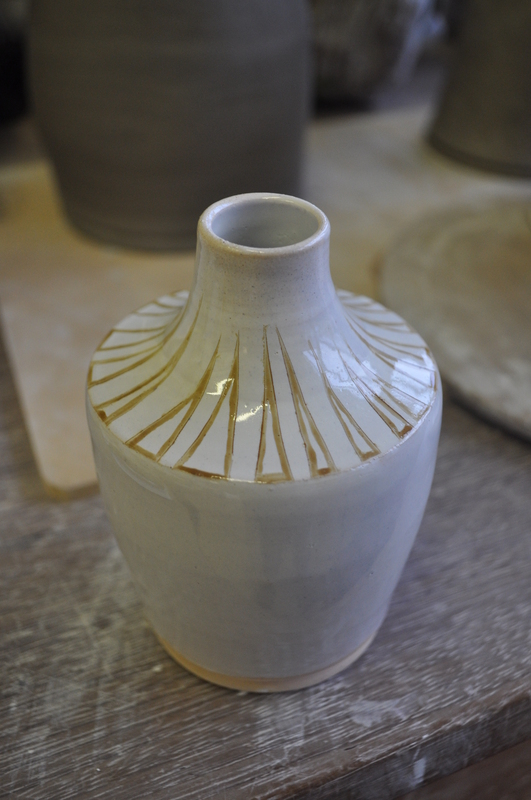 This is the first proper lidded piece I have made in this way and I’m very pleased with the finish! 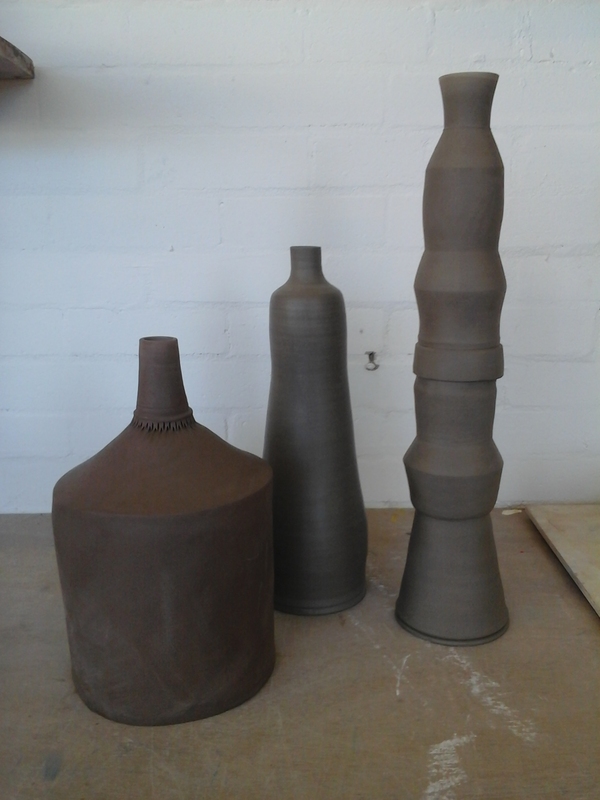 For these pieces I am using the same bottle forms and glazes, but in smaller sizes. 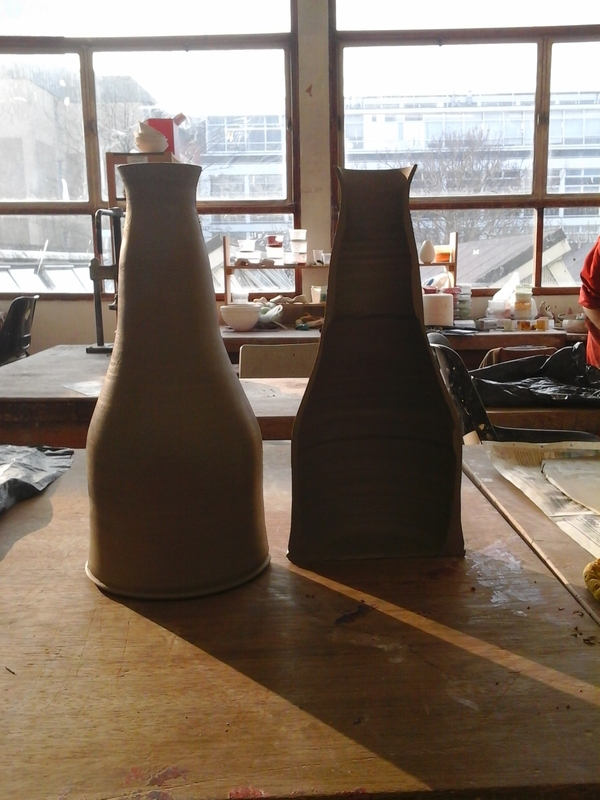 I have also started to play around with some porcelain for the first time (a little risky in final year!). It is so clean and white and smooth and it is sometimes very trick to use! It can collapse very easily and is a very thirsty clay – which means it dries out and can become overworked very fast! 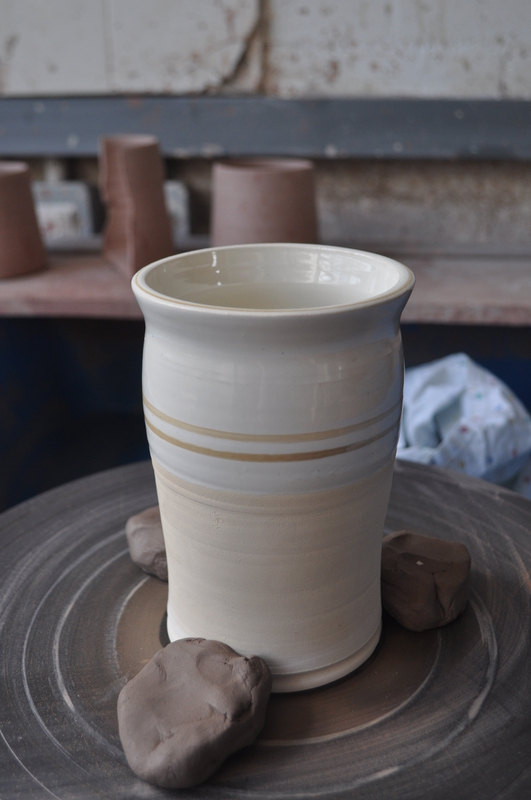 A tutor of mine, Lousia Taylor (www.louisataylorceramics.com) who is an expert porcelain thrower, has been giving me tips – such as throwing with slurry to create a barrier between the clay and hands, so it doesn’t dry so fast, which has helped me a lot! I’ve also enjoyed throwing with terracotta clay too, as well as petra and modelling clay. Quite a long post, so thank you for getting this far! Lots has been happening recently, and I have been making so many new discoveries and objects, but I will share some more photographs and the progression shortly! I also handed in my 8000 word dissertation titled “What Were the Motives for Soldiers making Crafts During The First and Second World Wars” just before Easter, so that was keeping me pretty busy too! Thank you to Alan Dell ( https://www.behance.net/alandellfe39 ) for the photo editing! 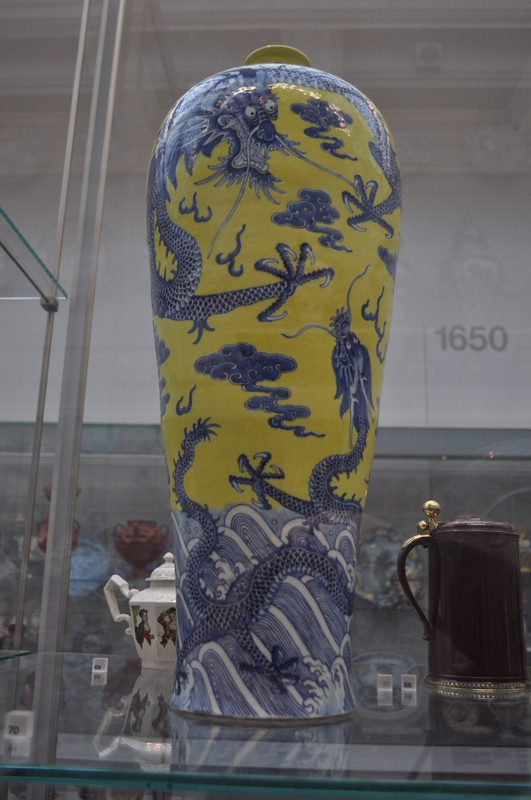 The Victoria and Albert Museum in London is probably one of my favourite museums in the world. It has so many objects and pieces of art and craft in it, its impossible to take it all in together. 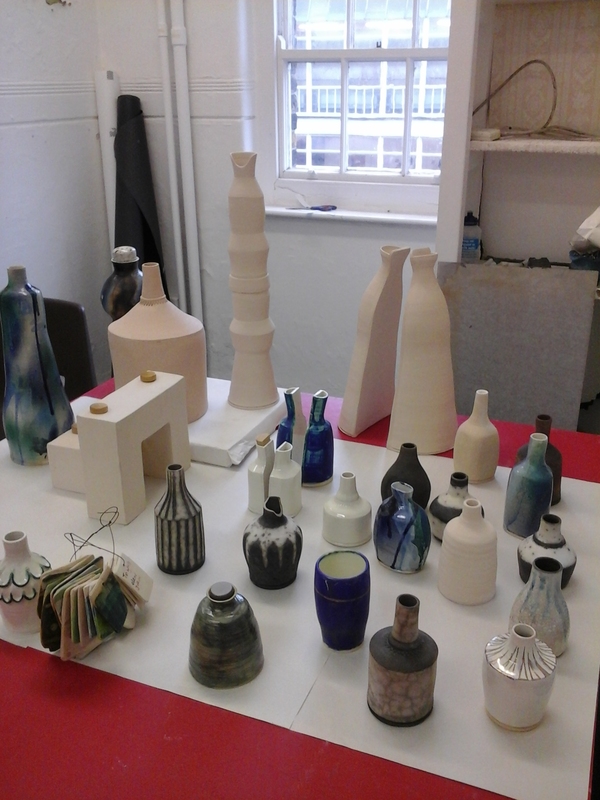 My favourite department is of course the ceramics rooms, which are full to bursting with exquisite pieces and also some lovely displays about how some pieces are made. 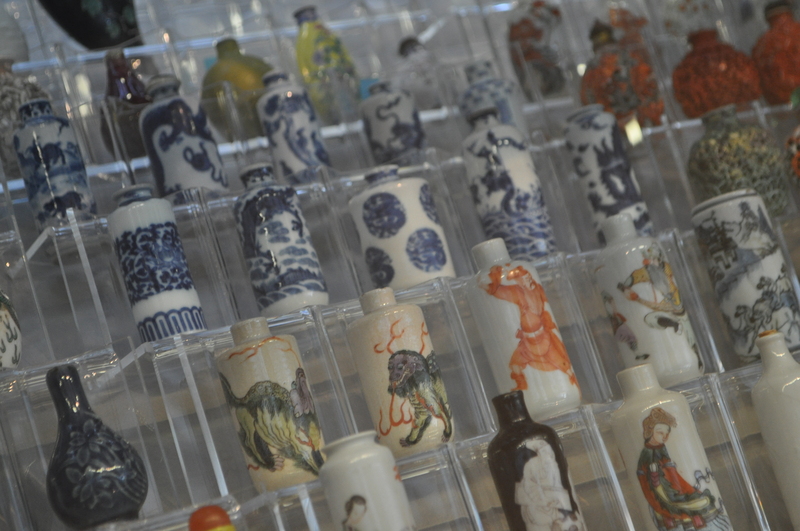 I remember these collections first sparking my interest in ceramics when I was tiny, and then again which I was at college and even now I see new things whenever I go there. 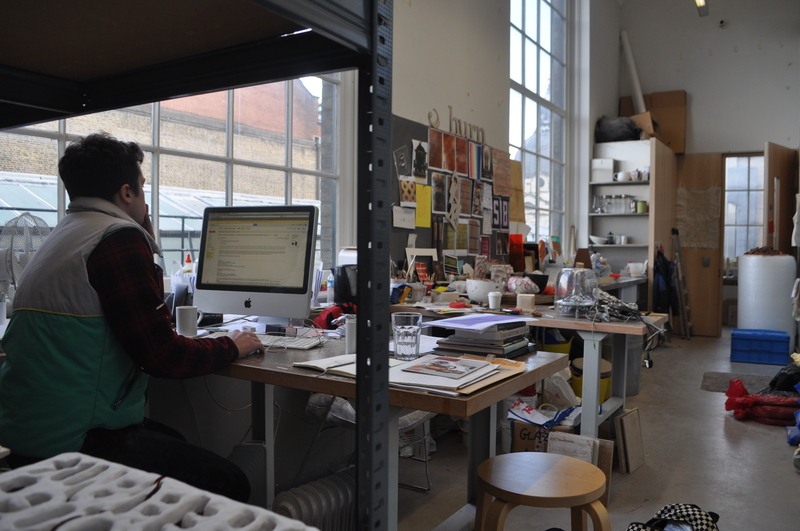 I was also lucky to catch Matthew Raw in his residency space, who visited to give a lecture and tutorials at Brighton uni a few weeks ago. He showed me around and then we had a chat about my plans once I graduate, giving me some tips he found useful and some good places to apply for residencies. 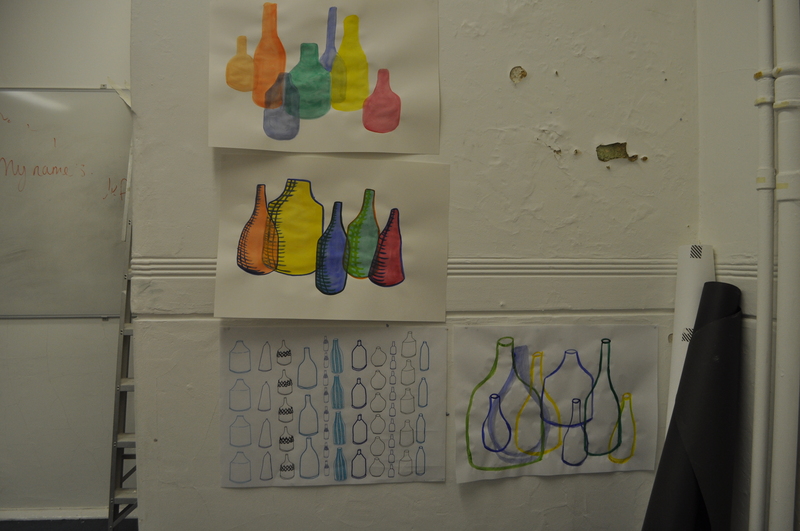 He showed me some of the things he’s been working on too, which look very exciting including running workshops and using objects from the museum collections as inspirations. Check out his website here; http://www.mraw.co.uk/home/pages/home.html and his pieces he’s written for the V&A website here; http://www.vam.ac.uk/blog/tag/matthew-raw. Thanks Matt! 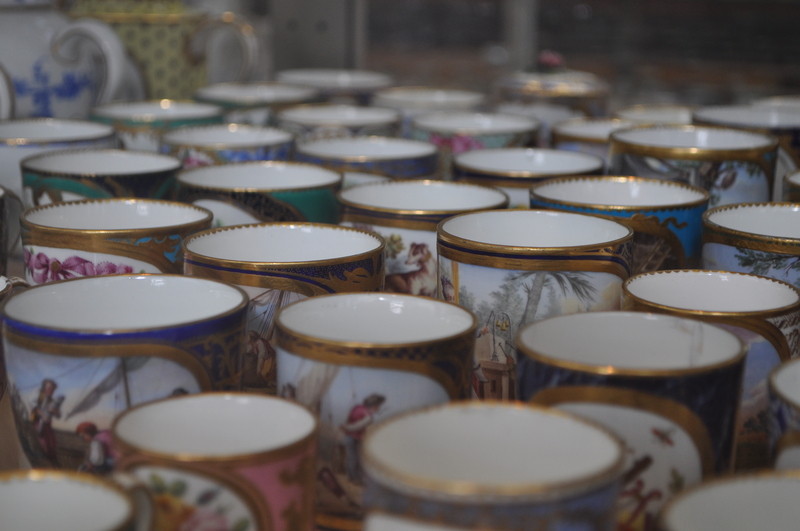 I loved these dainty French cups, so colourful and pretty. The gold and blue detail is lovely and gives such a feel of luxury and sophistication. 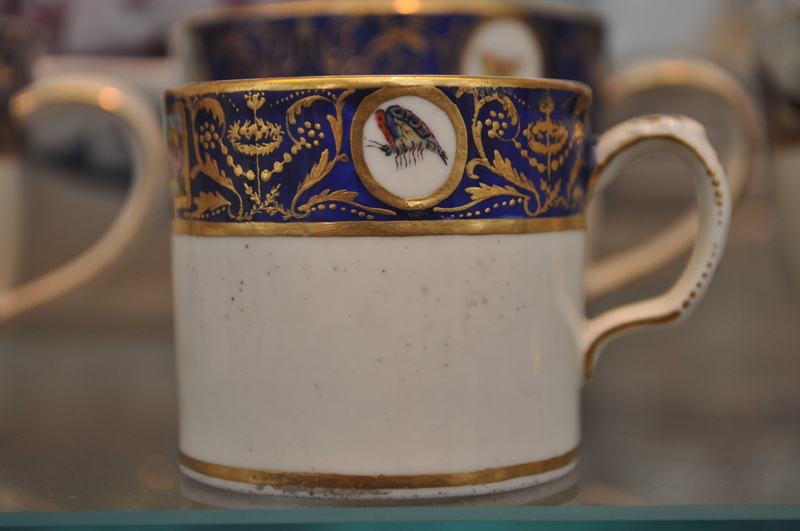 I’m also really into collections of objects – little tiny ones in particular! I often find myself drawn to grouping ceramics as I think they work well when they relate to each other and can be more powerful in bigger numbers. 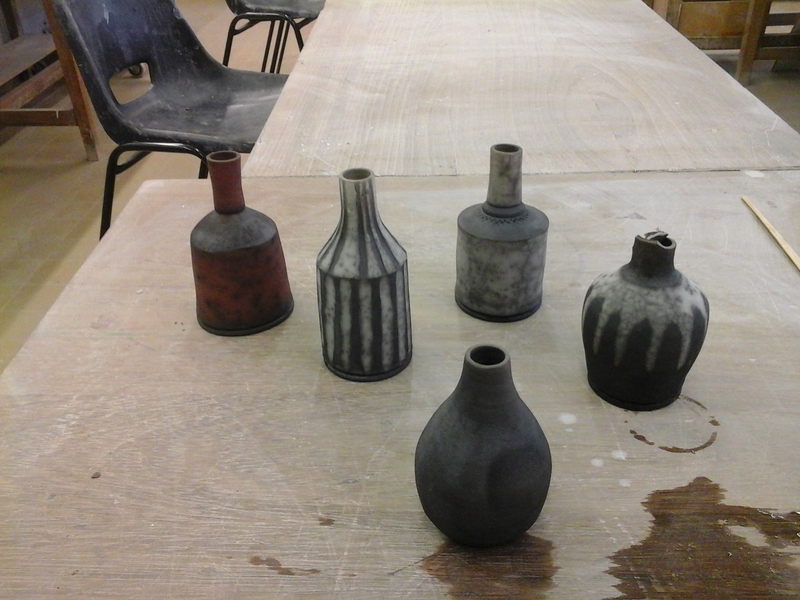 These are little Japanese bottles probably used for snuff. 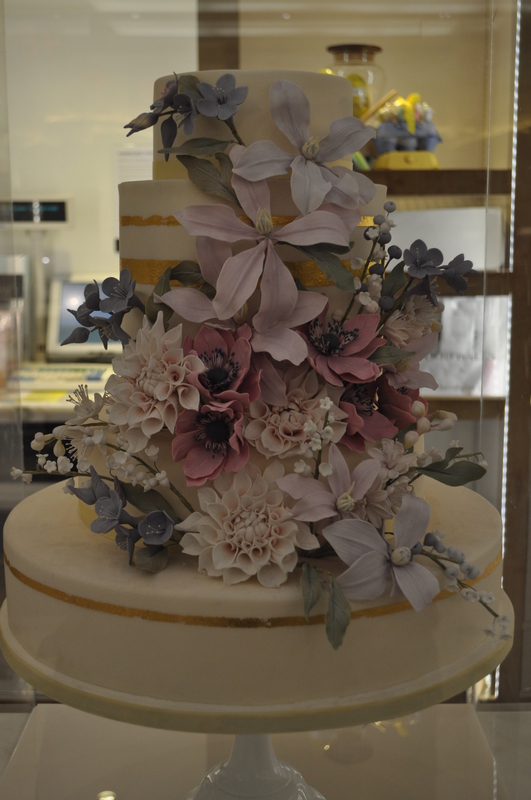 They are so detailed and carefully made! 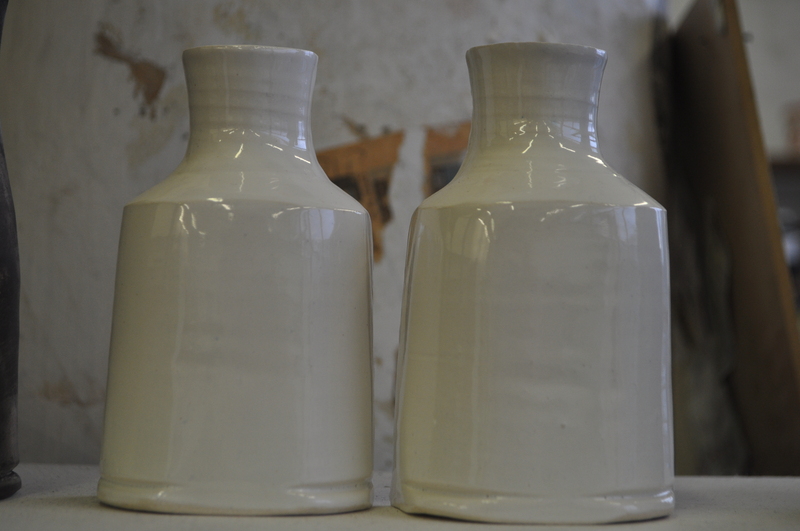 I also fell in love with these two pieces, the left one is Chinese, from the reign of Yongzheng and is a special piece as it demonstrates an early two firings process – allowing ceramicists more colour range. 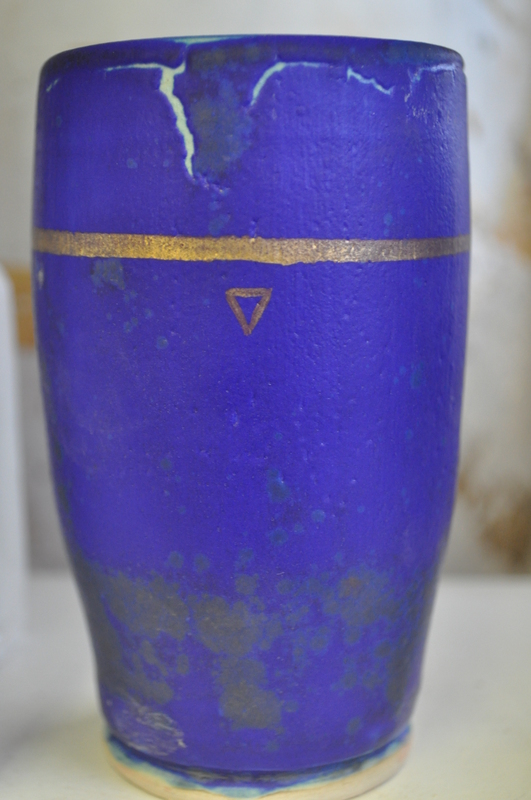 The second firing allowed for the yellow enamel layer over the top of the painted cobalt decoration. I’ve never seen a pot like it before, and I almost mistook it for a modernized version of the traditional white and blue Chinese ceramic! The right hand piece is Danish, with a blue crystalline glaze over porcelain with silver mounts, made by Royal Copenhagen. 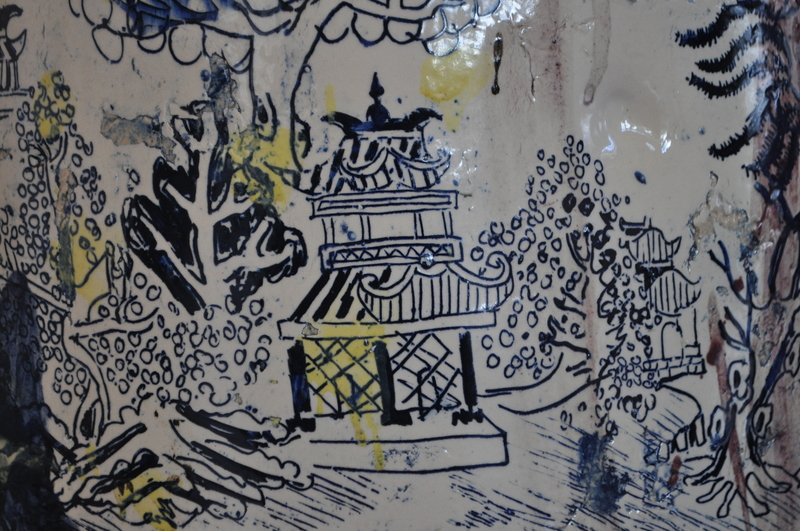 The next few photo’s are from in the Blue and White Transfer printed ceramics display. There were lots of pieces I liked, one was this bucket (aptly named “Bucket”) by Phillip Eglin. I like the drawings and the references to the traditional willow transfer print pattern. The plate is one of my favourites from the display, I just really liked the dragon and the amount of detail that can be produced just from one colour palette. 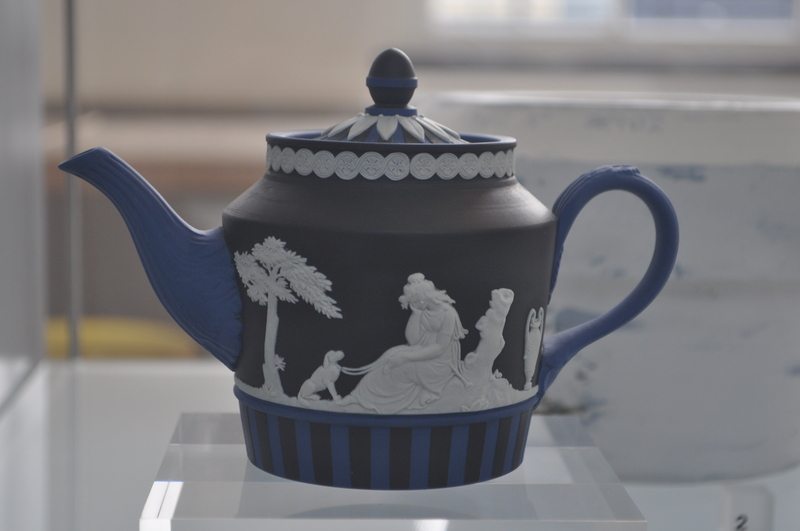 The last piece I found was a teapot, made in the iconic Jasperware style, but modernised by the addition of black to the typical blue and white, as well as the stripes. I’m not often a lover of teapots, but this one just captivated me. 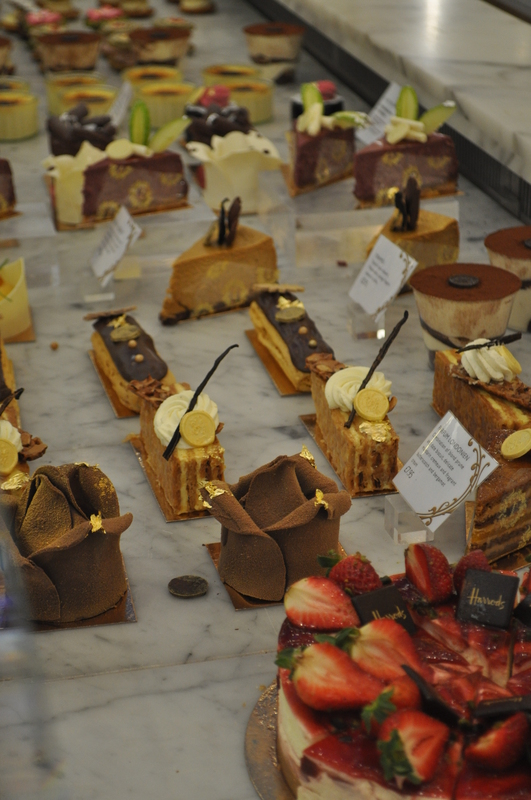 After a lovely day in the V&A, I met my parents and we had a little wander around Knightsbridge, and had a mooch around Harrods. 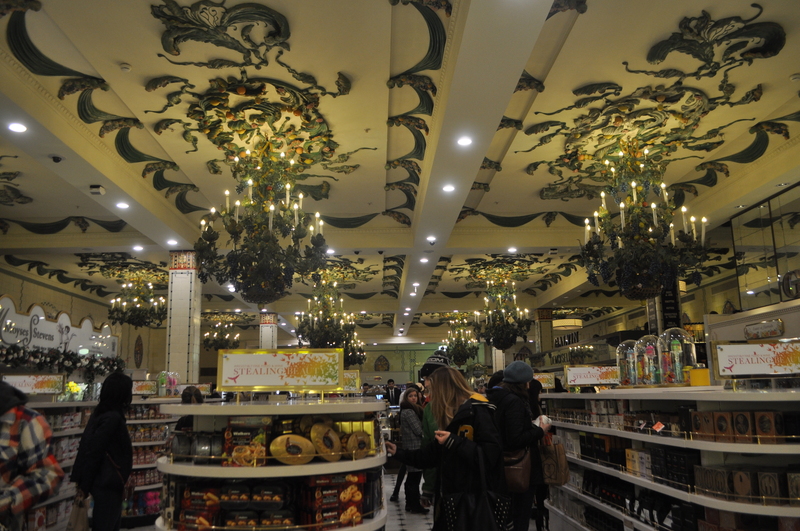 Its so beautiful and extravagant in there and my favourite rooms are obviously the food and chocolate ones! 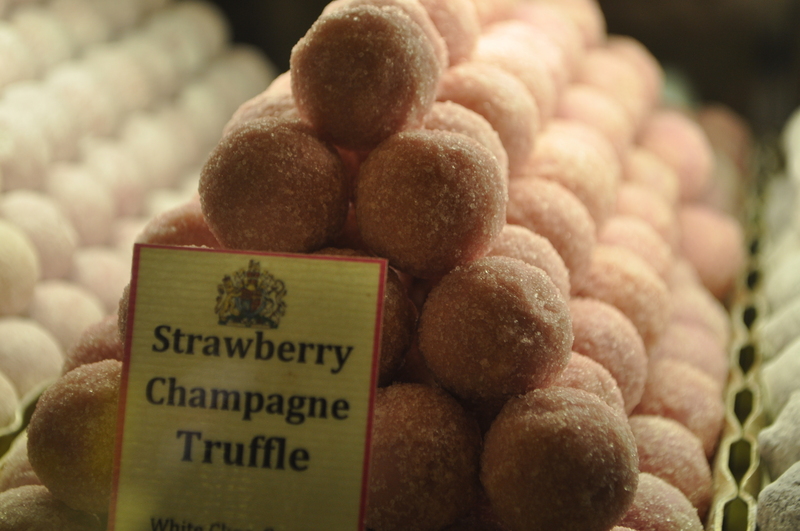 Its pretty expensive for most things (Well, for a student budget anyway!) but it was nice to look around a take some photos anyway! Naked Raku! 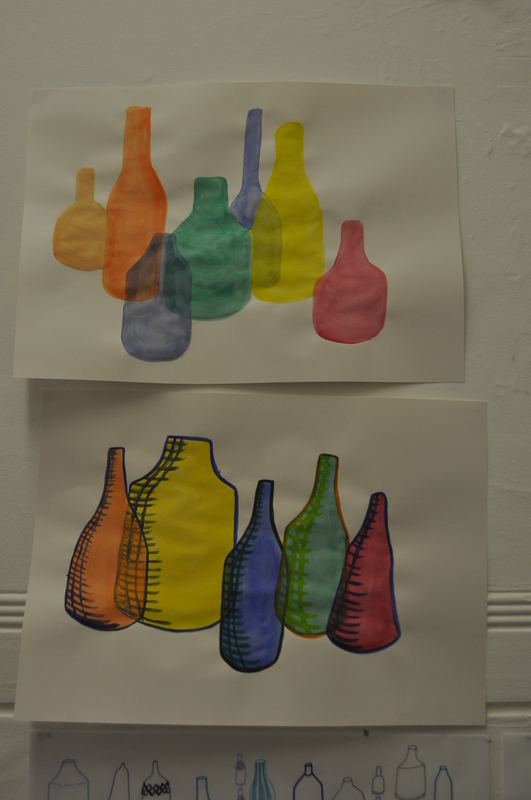 And Double Urns. 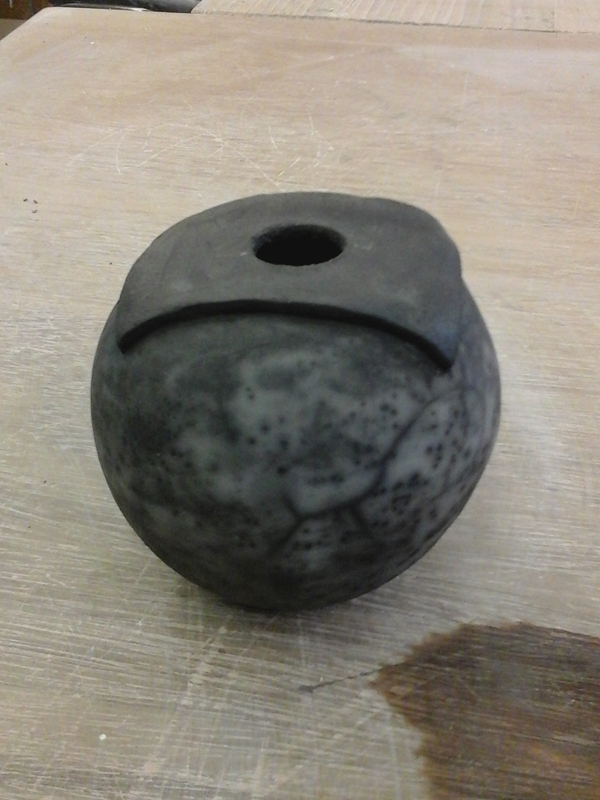 When I was on one of my placements in the autumn, I had my first go of Naked or resist Raku. 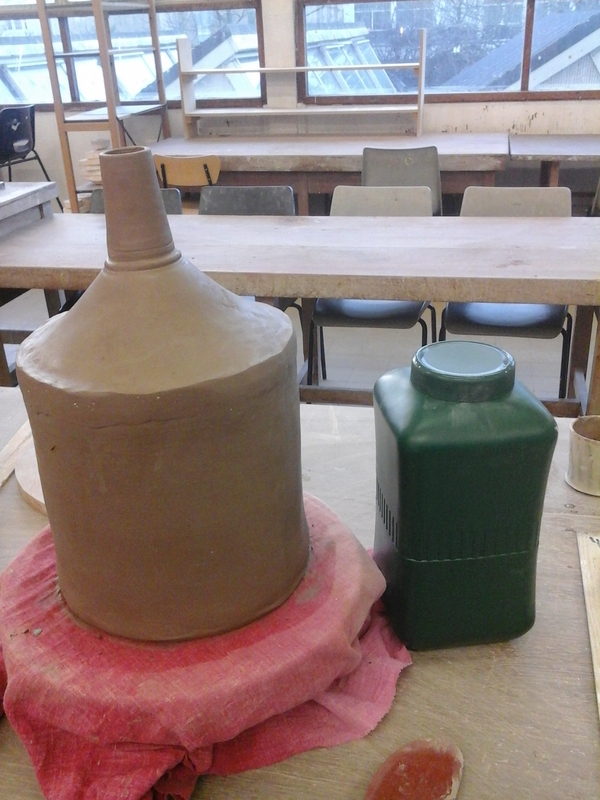 Its a process whereby bisqued work has a slip and then a low fire glaze applied to the surface. 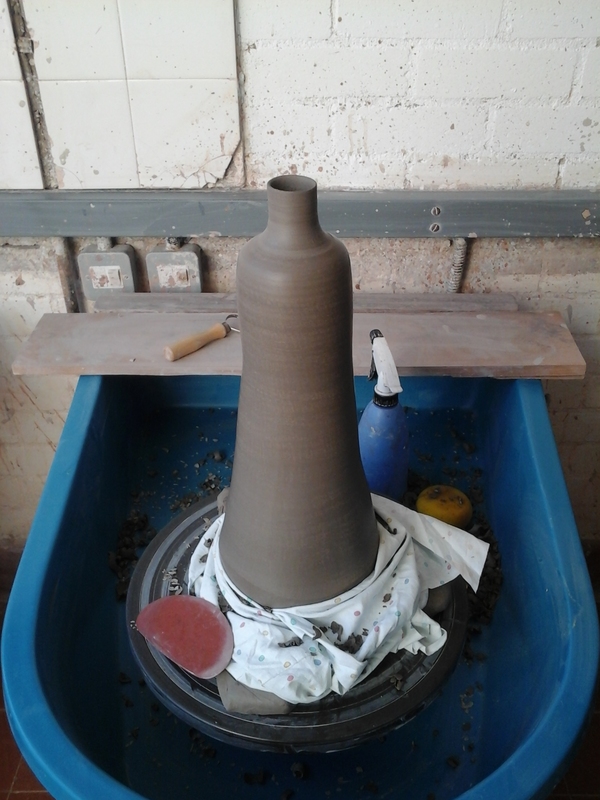 Its then fired up to around 400-600 degrees in a raku kiln, or when the glaze begins to shine and melt (I don’t use cones, just keep an eye on what the glaze is doing!). 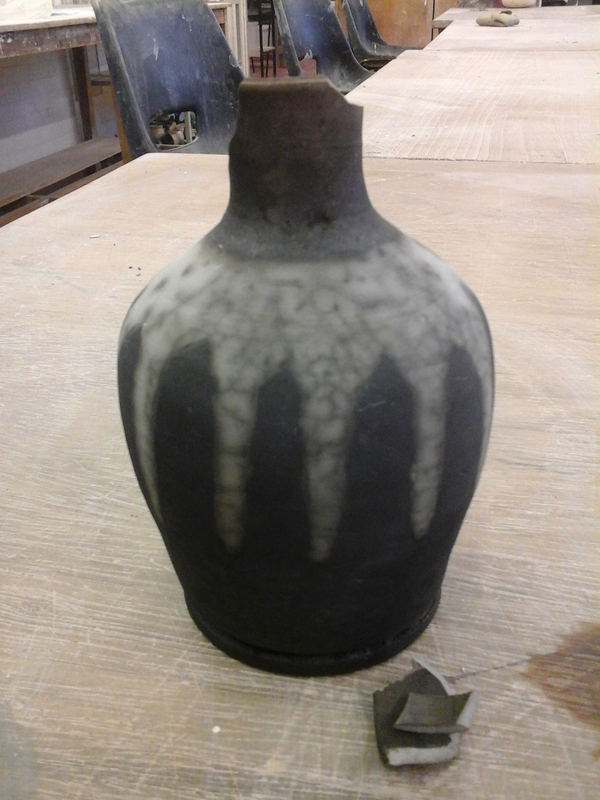 Then it is taken out of the kiln and reduced in a sawdust atmosphere to achieve the mottled black and white surface; the clay goes black where there was no slip and glaze resist, and white with black mottling where the smoke crazes through the glaze, marking the clay body. 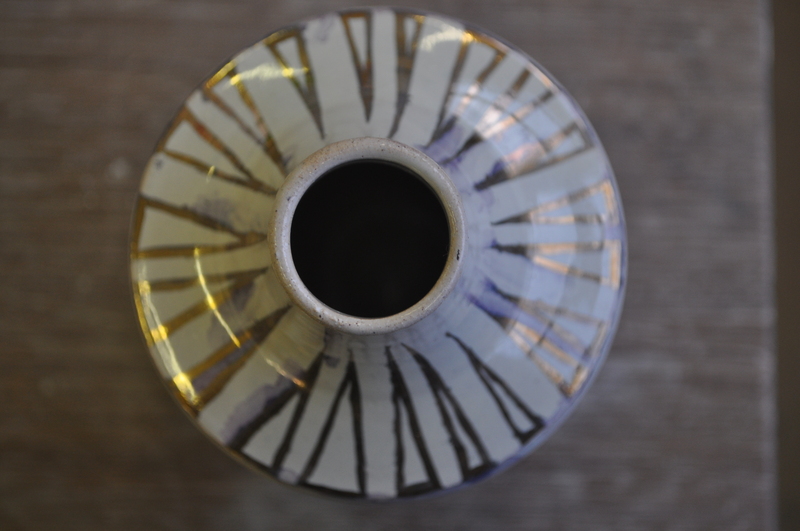 I’ve used traditional raku techniques quite a bit before and its a process that I really love – its a fast firing and its so action packed and exciting; its about the only time you get to take really hot pieces straight from the kiln. 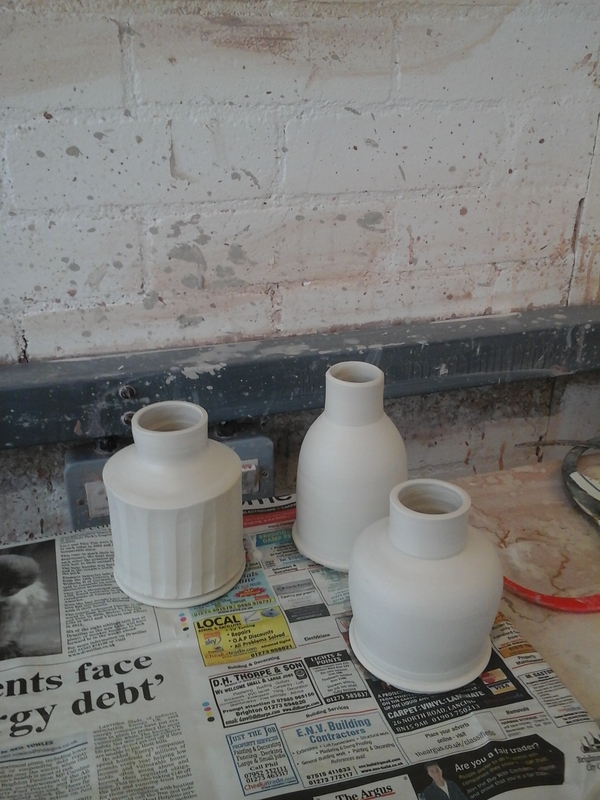 These pieces are just tests at the moment but I’m going to have a few final pieces based on them I think! Unfortunately one of the rims on one piece broke as it was quenched in the water, but I still really like the pattern on it. I also tried burnishing one of the pieces, but I think the white clay body looks duller when its fully burnished, without adding much more of a shine or smooth texture. I also tried terracotta and it came out really well! The unglazed/slipped part has gone a gray/black/silvery colour which looks really nice in contrast to the deep red of the body. 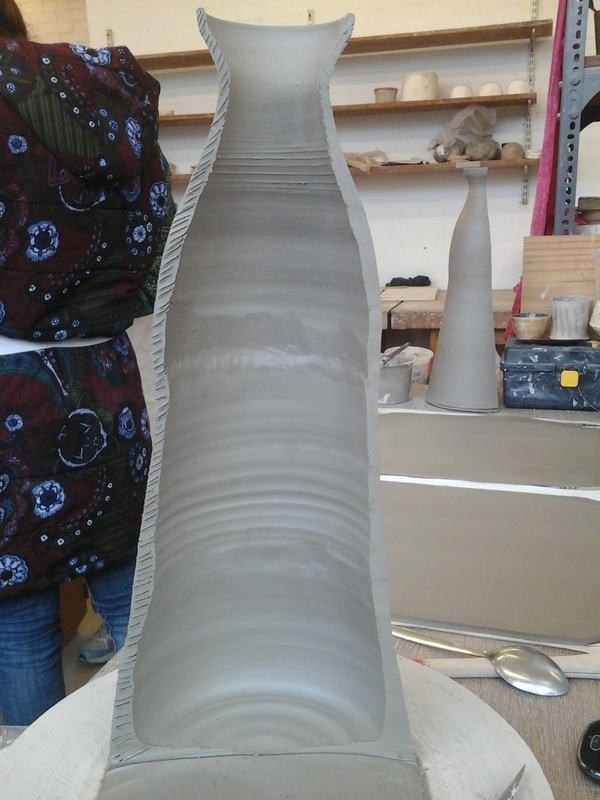 I’ve also been throwing some large urns in sections. I am happy with how they are going so far, but I’m still working on refining the form and turning them back better on the wheel before I slice them in half. This one is probably only just big enough for two (Small) people, but I’m working on another that is much bigger! I also had a formative assessment last week, which meant trudging all my work to another uni building up a million flights of stairs! But it was good to get out all of the work for this project so far and reflect on what I have made, what I need to do next, and how I can improve. Here’s the work so far, all of which is in the testing and experimental phase, but lots to go and work from! In the photo is a little sneak peak of some stackable pet urns I’m working on too! A few weeks ago I borrowed some gold lustre from my wonderful friend Alison, and was experimenting with it on top of some of my pieces. I put some of them back onto the wheel to get some nice thin lines, which I think has worked well. 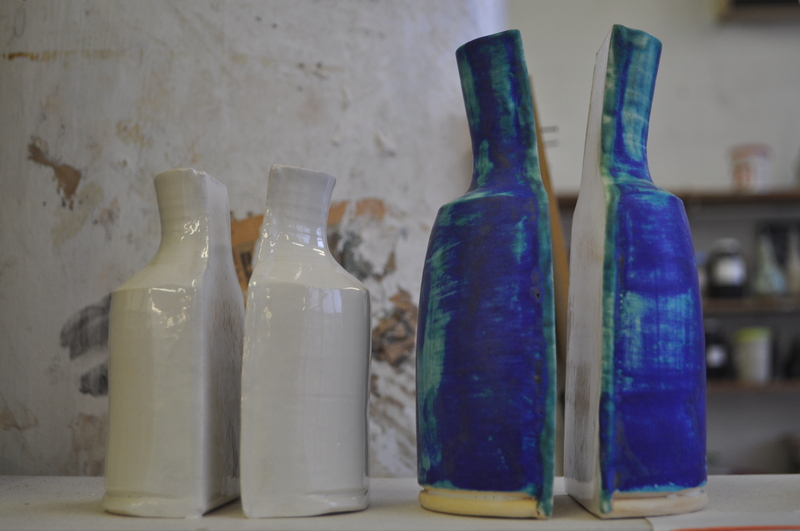 The three photo’s below are before the final firing (They are painted on top of the glaze then fired to around 750 degrees). I’m really pleased with how they have turned out, although they are not as bright as I intended – I may need a slightly thicker layer next time. I really love the gold over the deep blue barium glaze and I think I will be using a little lustre on some of the final barium pieces. 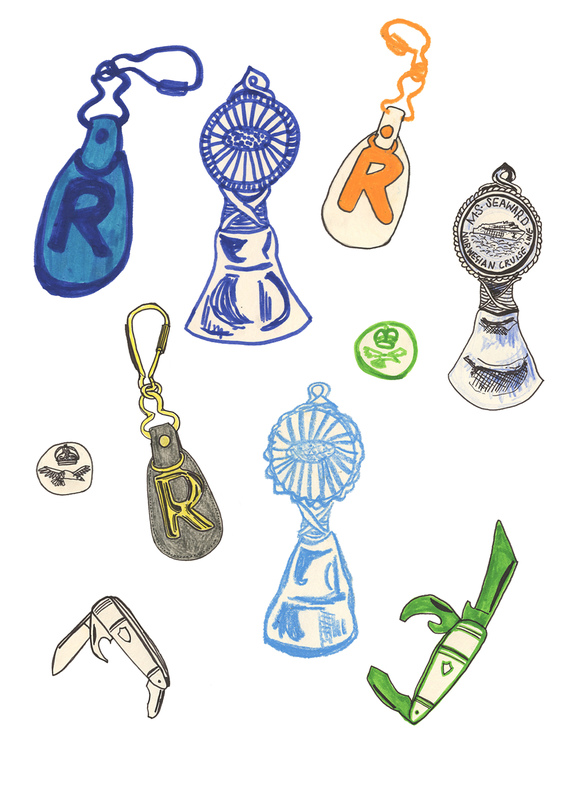 I also made some small pendant shapes, as I may make some small jewellery pieces to accompany an urn or two. Last year a few people said they like the idea of me making memorial or remembrance jewellery, and I love the idea of them relating back to the urns, but being a wearable, comforting reminder of a loved one, but one that is subtle and beautiful. 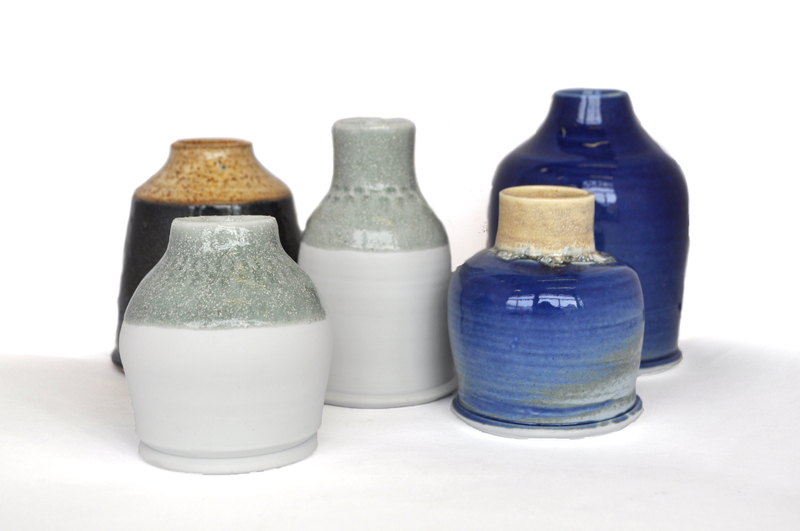 Like my urns, I intend to make beautiful tributes, but pieces that are not so obviously urns – they will be a reminder but not an obtrusive, painful one. An essence of a missed friend or family member. 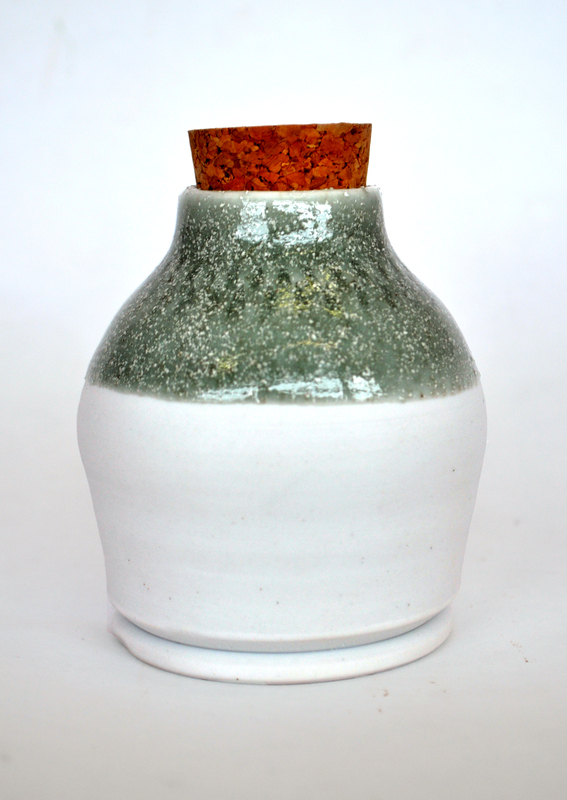 I did a resist Raku firing recently too, so I will be putting up images of those pieces soon too. I also had a really great group tutorial session with Matthew Raw (A member of Studio Manifold, check the group out here; www.studiomanifold.org and Matthew’s work here; www.mraw.co.uk/home/pages/home ) He was really helpful and surprisingly told most of us we need to get out of the studio, look at what’s out there in our field, and research deeply what we are interested in so we can bring it into the studio and into our work. Investigate, discover and find out and record why were are making the choices about our work that we are. So more research and trips planned for the next few weeks! 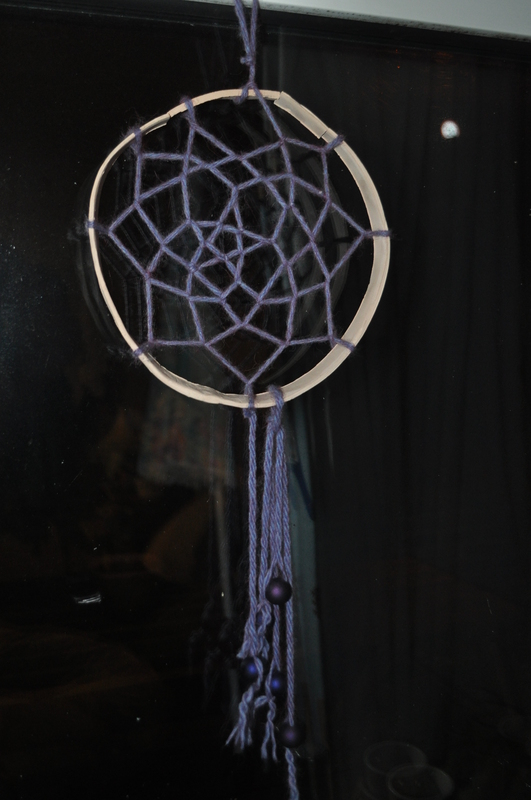 As a little break from uni work, I made a dream catcher last week! I was trimming one of my big vessels and the circlet I cut off makes for a nice frame instead of the traditional willow branch. 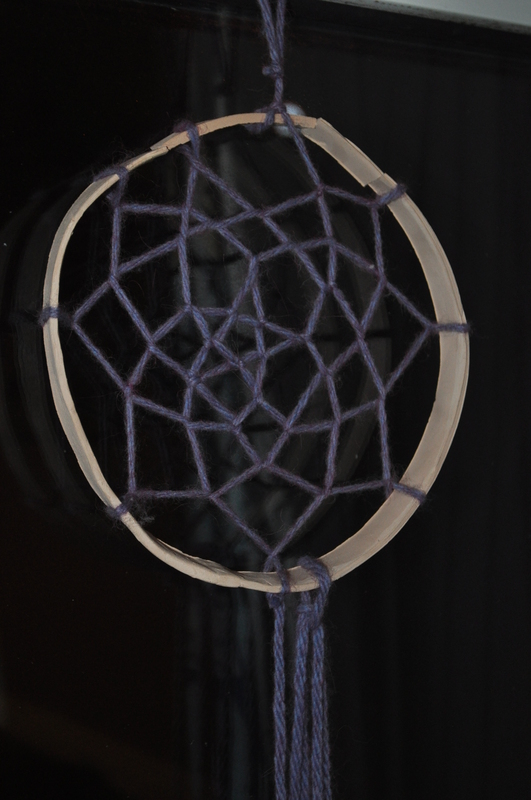 I’ve made a dream-catcher once before, but I was only about seven, so I probably had a lot of help! You can see my first dream-catcher in the photo of my room (Below) from when I moved into my first house at uni – Its moved with me everywhere! 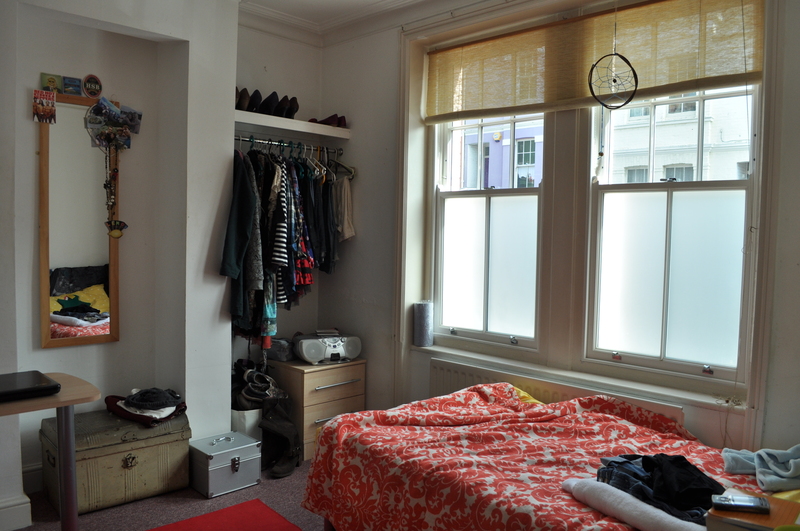 My first year room at uni – with my old dream-catcher. I started following a howto guide online, but then just started to make it up as I went along, and the middle somehow became a star shape! I’m pretty pleased with it and I hope I’ll be able to replicate it! Unfortunately SOMEONE accidentally broke it before I could photograph it properly, but I managed to wedge the broken piece back in. I’m planning on neatening up the hanging threads and maybe adding to it too. 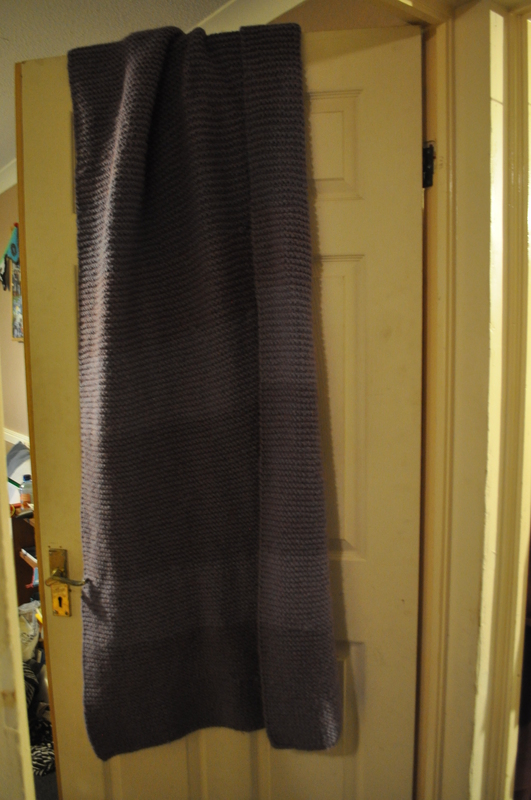 I have also been knitting a massive, what started of as a scarfy throw thing, and now is pretty much a blanket, when I first got to uni. I’m not a slow knitter per say, its just that I forget about it for ages then pick it up when I feel like relaxing and having a little knit. My nanna taught me to knit when I was younger; she is a diamond lady and an amazing knitter. As you can see it is pretty big! 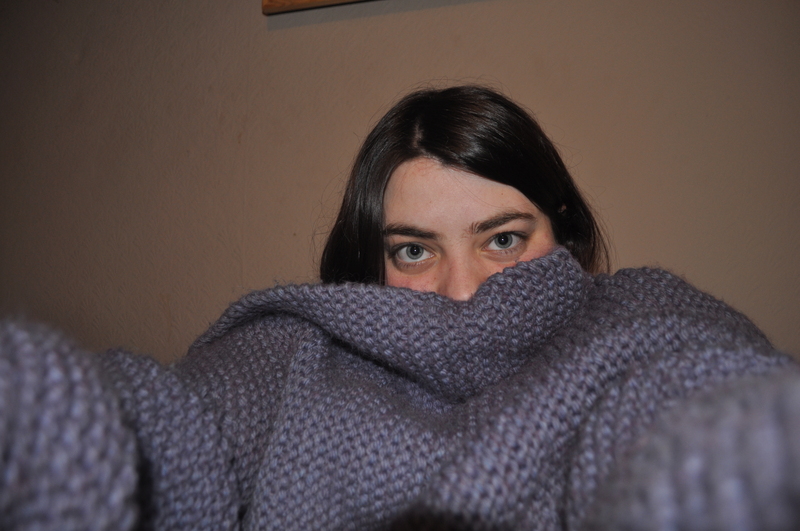 Its made of Alpaca wool and it is super thick and snuggly! The colour is beautiful, sort of heather/ amythest purple and blue. 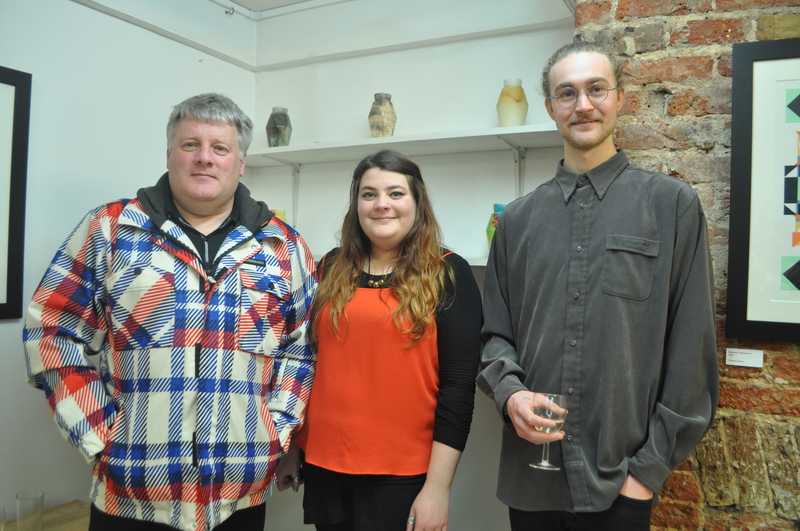 Experimental dual urns and the private view! So I’ve had a pretty busy week; developing new forms and ideas, testing out new glazes and the private view for the show at Gallery 31 in Brighton! 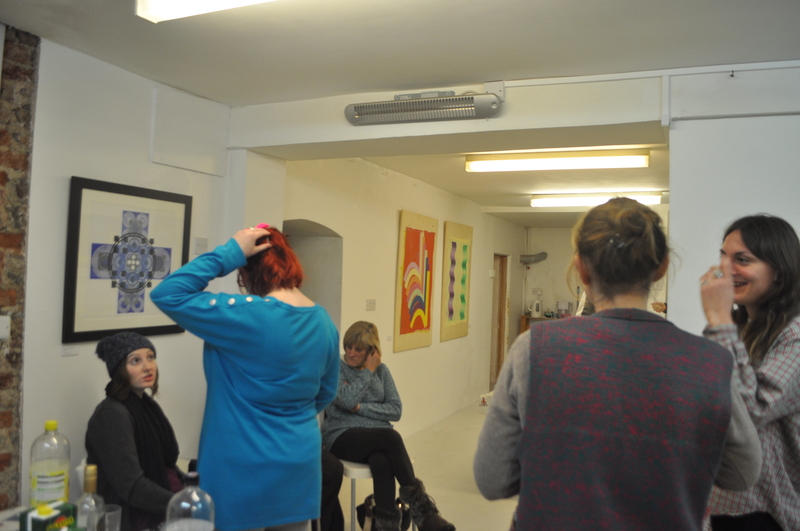 This is the first show in the new gallery space in the centre of the North Laines, and it was quite a new experience for me – getting the work framed and ready to hang, delivering it to the gallery and organising the drinks! 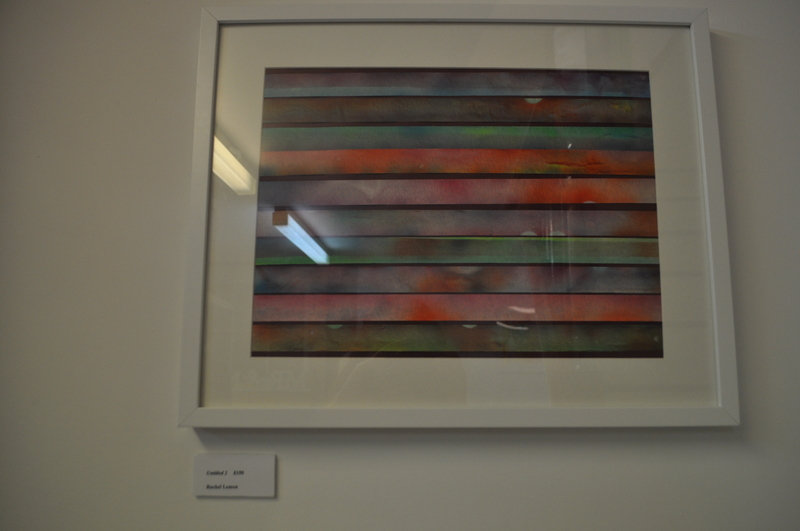 There were two other artists, one of them being my Dad! (You can see his gorgeous wood block prints here; http://thomaslemon.weebly.com/geometric-prints-wood-blocks.html ) and the other was Ben Musitano (See him here; http://thecasualclub.tumblr.com/) It was a great first little show and thanks for everyone who came down to support us! 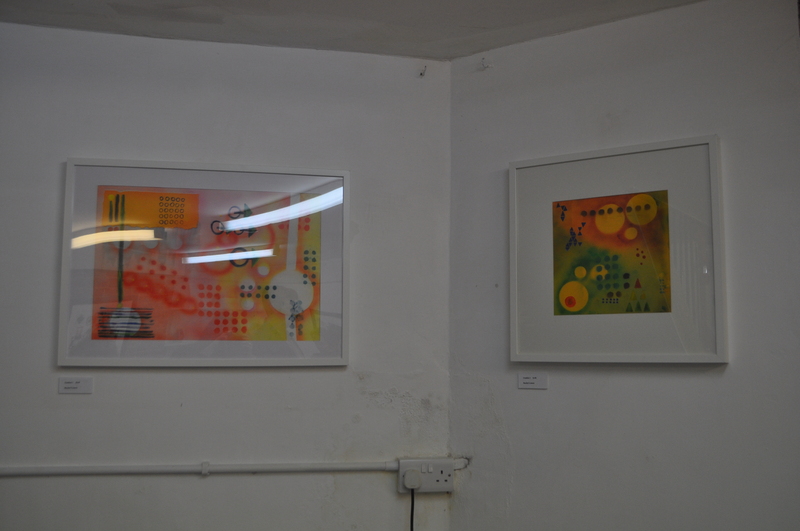 The work is all for sale so pop down and see it and get in touch if you are interested! 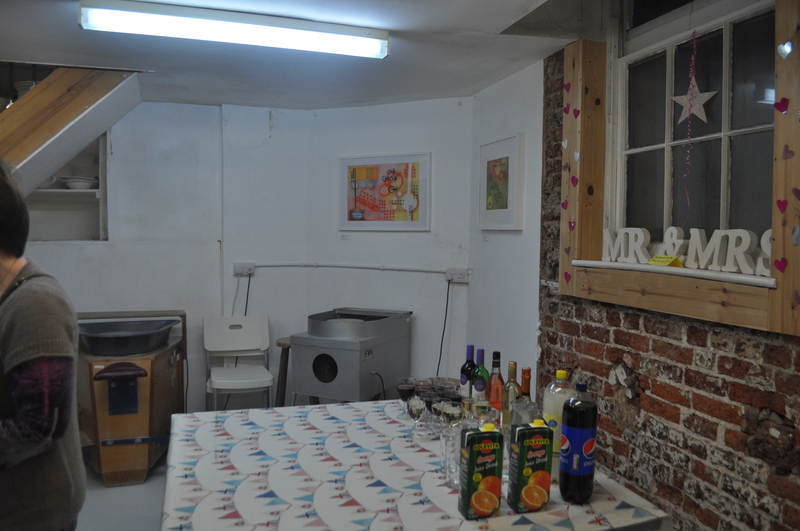 It is open for the next two months, at 31 North Road, Brighton. 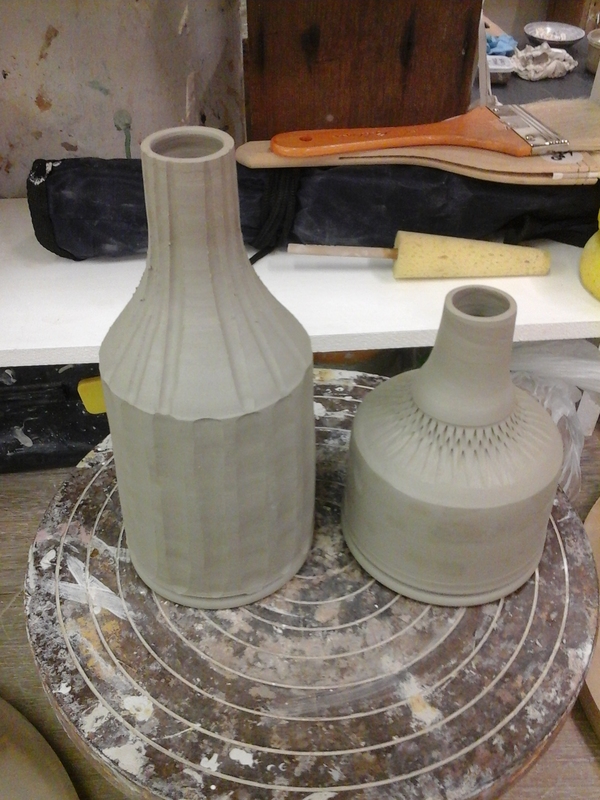 I’ve also been working on dual urns – I am throwing a single bottle form, and then slicing it in half and adding a slab on the back of each. They are from the same piece, the same structure. they are one; yet they become a piece by themselves. 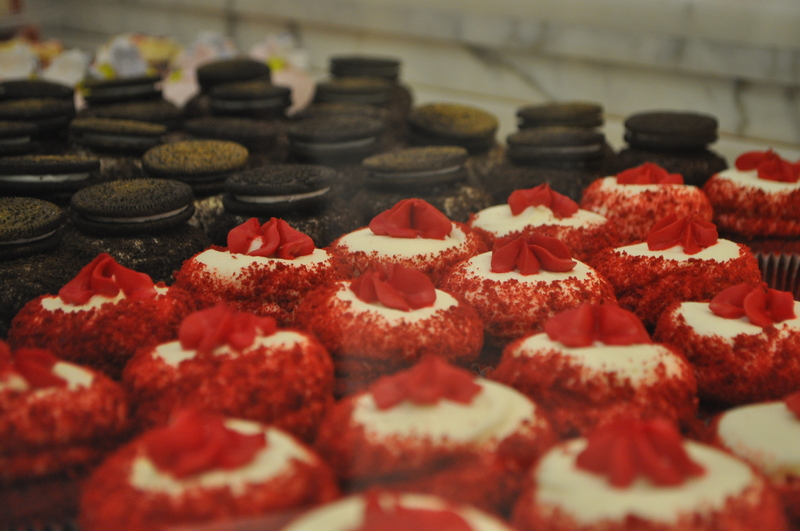 They complement each other perfectly. 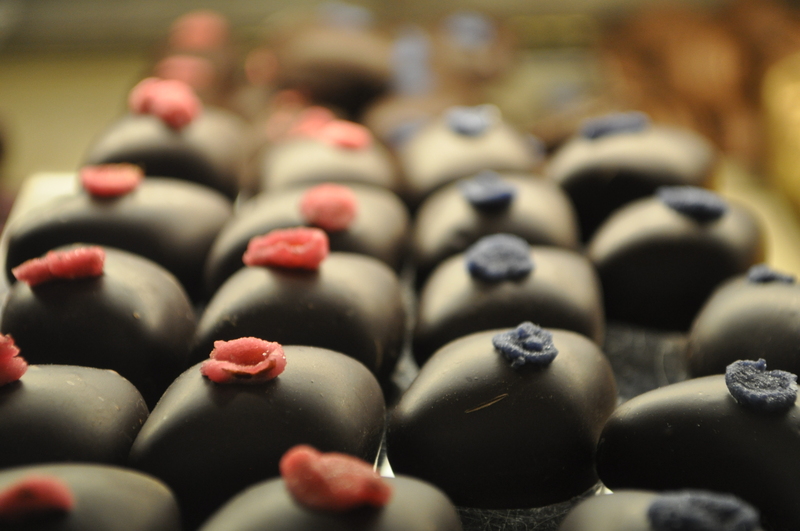 During the drying process. 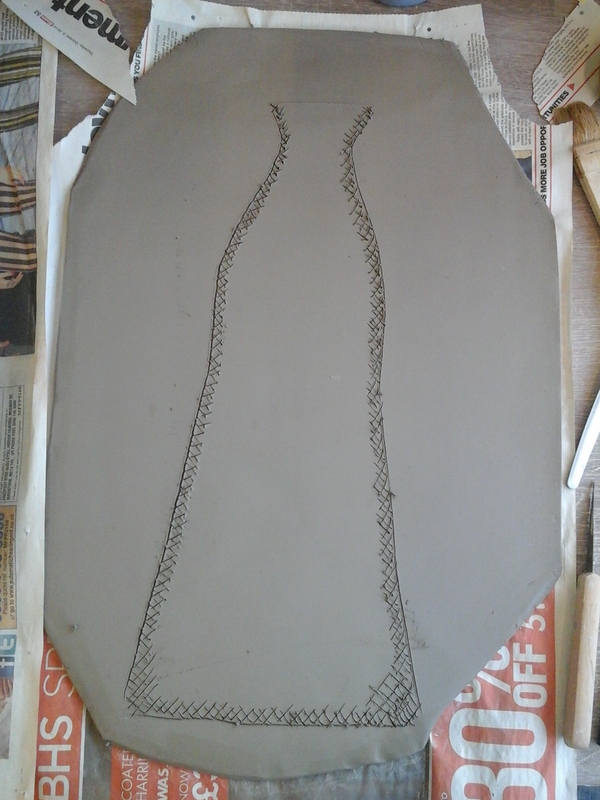 the neck and rim slightly curves away which I really love. I really like the new barium blue glaze as well, which I’ve been developing based on the Mexican colour Azul Anil, which is a deep matt blue thought to ward off evil spirits (lots of mexican homes use this colour, as well as the home of the famous artist Frida Kahlo). 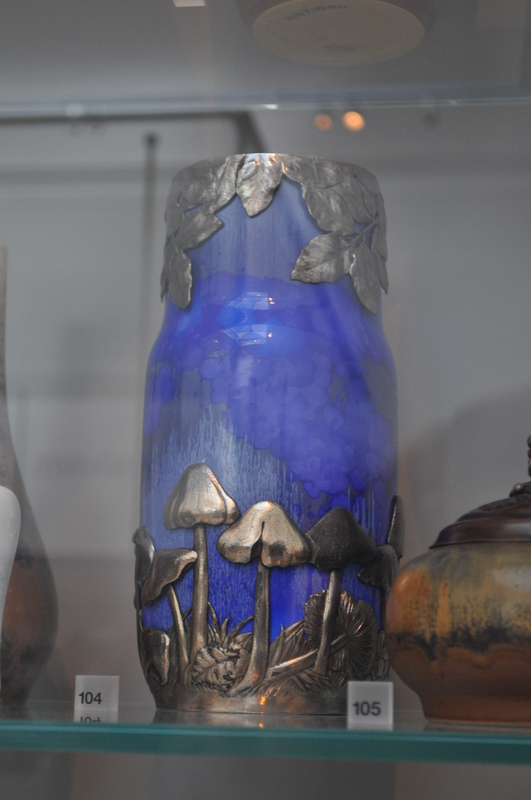 I am going to be making these much bigger soon, and will be experimenting more with the finish and the glazes! 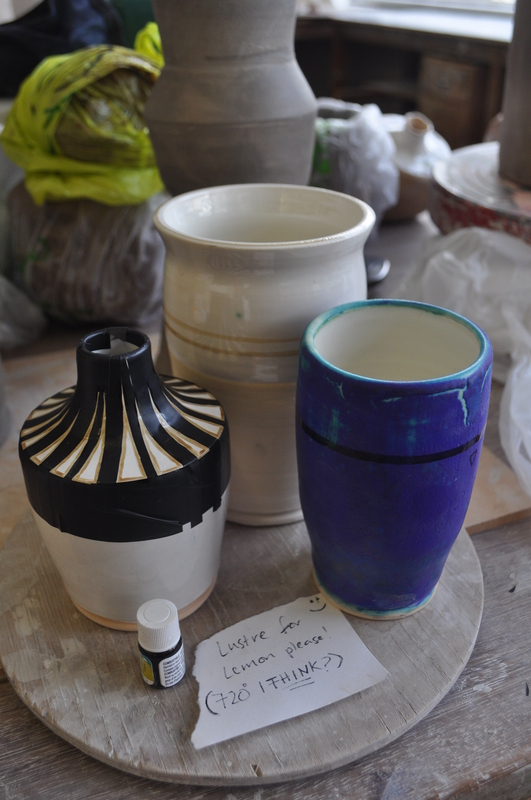 New (Bigger) Pots….and my first upcoming show! 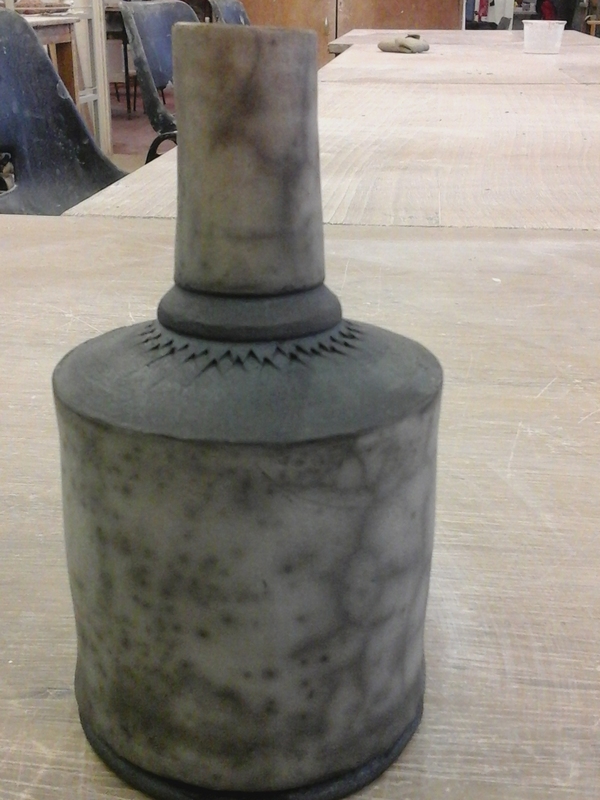 So recently I’ve been trying to throw and make bigger pieces for my urns project. 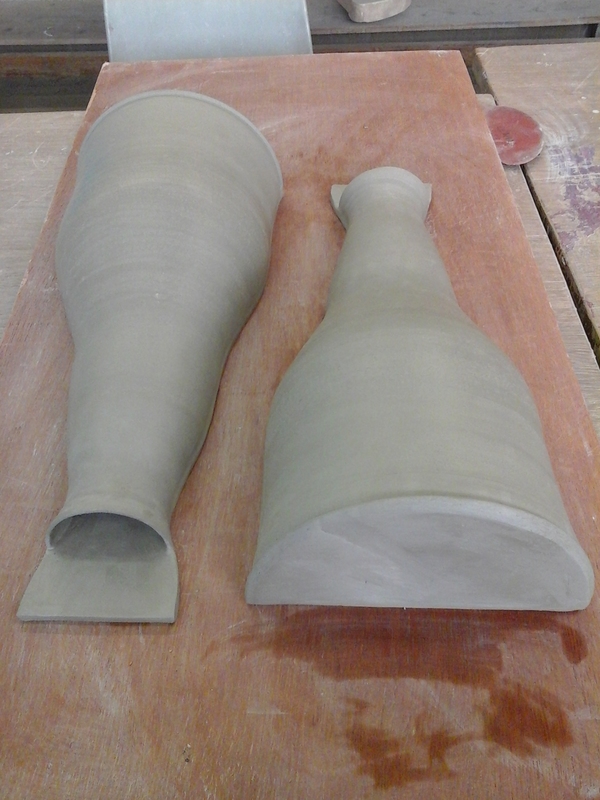 I’m making single and dual urns, and they need to be pretty big as a typical single urn holds around 3500 cubic cm! 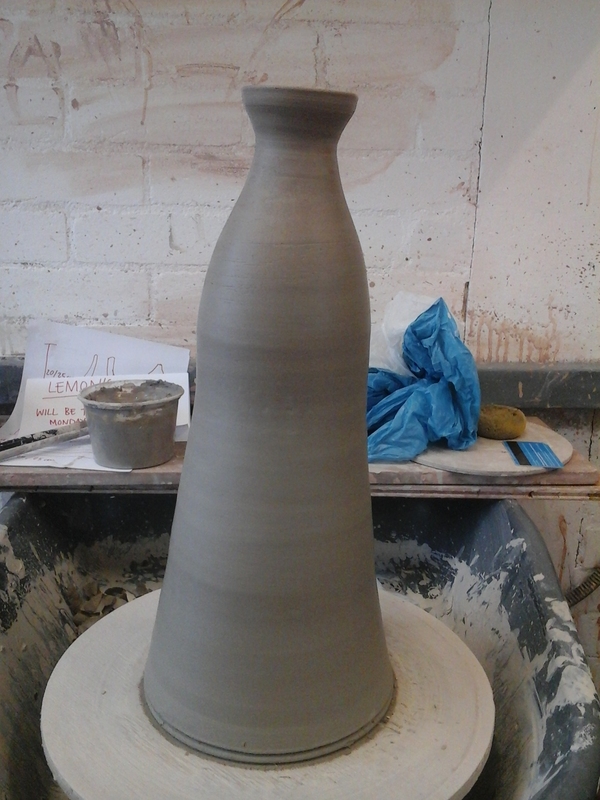 I am really pleased with the outcomes and the forms that are coming through so far, and I if I keep working on my throwing and finishing skills, I’m sure I can produce some beautiful BIG urns soon! I’m also still working on the forms and the surface patterns and here are two smaller ones that I’ve been experimenting with this week! 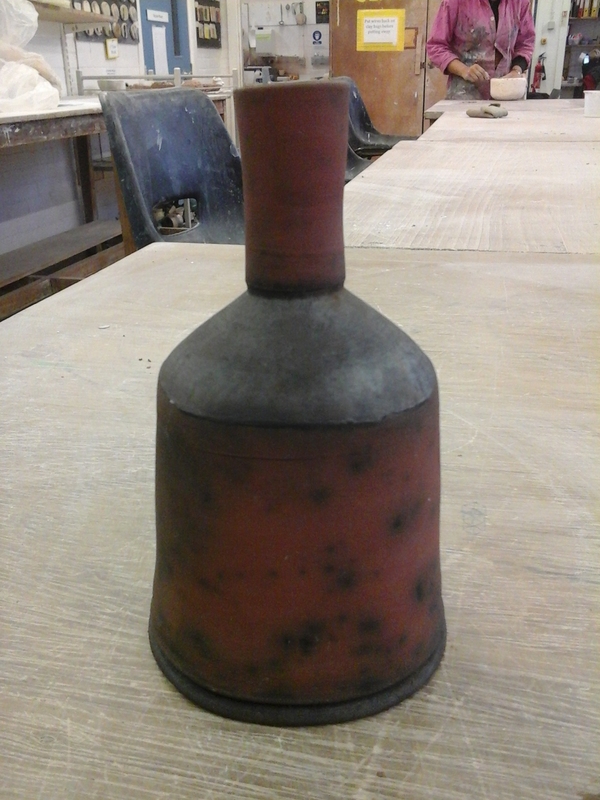 The taller one i hope to test out in a naked Raku in a few weeks! I have also been asked to have some of my work in a small show in a new Gallery in Brighton! 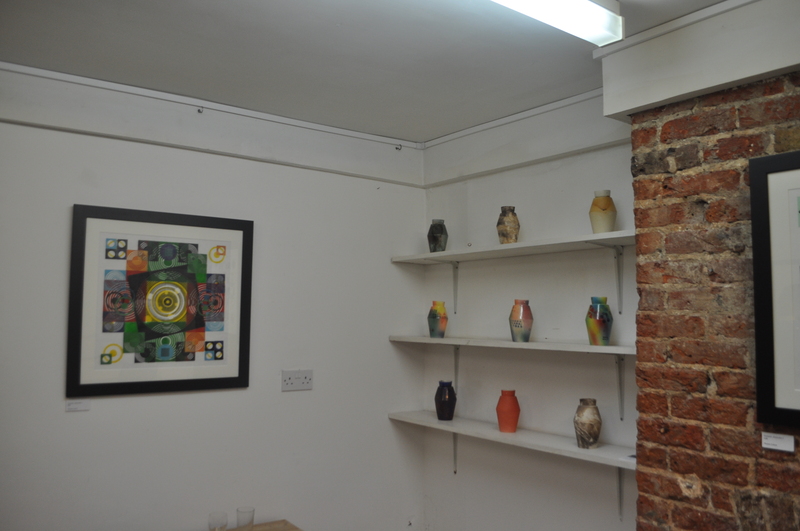 The private view is only next weekend, on the 24th January! So not long to prepare but it will be an exciting opportunity to show some of my work. I will have a few of my scatter urns, some colourful test tiles and some hanging paper works too, so please feel free to come and see it! Here is a link to the event page on Facebook or contact me for more details. 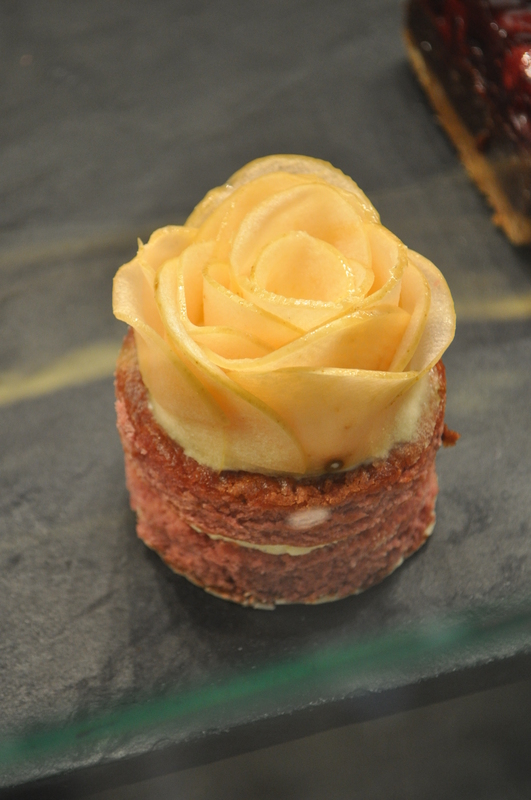 Photos from the show to follow!